While many of us know a woman who has had a difficult pregnancy or had complications giving birth, we rarely think that it will be a challenge for our dogs. We tend to think that since their wild counterparts give birth all alone, in their natural habitats, they must just instinctively know what they are doing and not experience any problems at all. However, our dogs do need our support while they’re pregnant and sometimes they need our assistance delivering live, healthy puppies. In this — part 1 of my 2 part series — I will outline some key aspects of monitoring the pregnancy itself. Later, in part 2, I will discuss the actual labor and delivery. First of all, let’s remember that our dogs are not wild dogs. Even though your dog may still have some of the same survival instincts as a wild dog, she is no longer physically a wild dog. Odds are she doesn’t even look like a wild dog. Maybe she’s a short stocky dog like a bulldog with a dainty, narrow pelvis and a big, adorable head which may be cute to look at but is not at all functional when she tries to pass another little being with a similarly huge head out through her tiny pelvic canal. As a result, the National Center for Biotechnology Information, reported C-section rates in Boston terriers, bulldogs and French bulldogs exceeded 80%. So do your research and know what reproductive problems may be more likely in your breed. Secondly, try to know your dog’s due date so you will have some idea if she becomes overdue. I say try because sometimes the opportunities to be exacting in that determination pass you by before you even realize your dog is pregnant. The average gestation period in dogs is about 63 days. If, however, you are working with your veterinarian from the beginning (and you should be), then hormone tests that time ovulation and/or vaginal cytology that identify stages of the heat cycle can be performed to give you a much more reliable due date to plan around. Then, as the predicted due date draws near, you should start taking your dog’s rectal temperature at the same time every day because dogs should go into labor within a day of their temperature dropping below 99-100 degrees. How many puppies are coming? Meanwhile, in addition to knowing when to expect puppies, it is really useful to know how many puppies are on their way. Litter size varies widely amongst dogs, who sometimes rest for a while in between deliveries. Knowing whether or not you are still expecting more is extremely helpful — especially at 3 AM. Keep her active and fit and pay attention to her appetite and her comfort level. If her expanding abdomen is making it harder for her to eat big meals, feed her smaller ones. Consider switching to a more calorie-rich puppy formula in her last trimester, and call your veterinarian if your dog exhibits signs of nausea or stops eating. Notice if she is having any difficulty getting comfortable and offer her choices of where to rest/sleep: someplace softer, someplace cooler, even someplace on a slant. (I’ve known some very pregnant dogs that chose to sleep on their owner’s treadmills so their back end is ‘downhill’ and the mother can breathe more easily.) 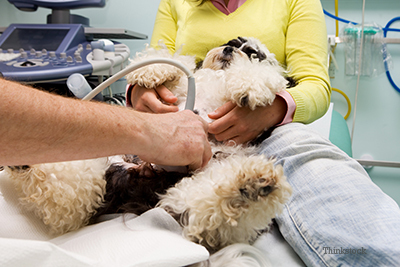 Obviously if your dog cannot get comfortable or seems anxious or distressed, contact your veterinarian. Note any vaginal discharge. Occasional clear or white mucus discharge is normal. If you see discolored or bloody discharge instead, call your veterinarian. If anything else concerns you at all, contact your veterinarian. I hope you see a trend here. Communicating with your veterinarian is always key because, as I mentioned, your dog is not a wild dog alone in the world. How lucky for her — she has you.